There is a lot of hype about the transformative energy in Colombia, specifically in Medellin. Things have changed dramatically since Pablo Escobar’s cocaine capital violently erupted in the 1990s, making it the most dangerous city in the world. While many perceptions of Colombia around the world are still informed by the days of the huge drug cartels and ensuing civil war, there is a lot that has happened. Be this as it may, evidence of the conflict abounds in Medellin. Plaza de las Luces and other spaces and landmarks commemorate not just those who lost their lives during the conflict, but the national psyche which was turned on its head during the war. Botero, reported to be the living artist with the most expensive works, had a statue he donated to the city used as a pedestal for a bombing in 1995. He insisted on maintaining this as a symbol for the city and the country’s memory. Just as Medellin’s centro has many of his bronze statues, it also contains many such symbols that are a reminder of the city’s violent past. The city wears these scars, as do people. It is not uncommon to see amputees, victims of the pervasive use of mines during the war. But as was explained to me, this is summary of the conflict is just a “cartoon” or a mere caricature of the real complexity of the legacy of colonialism, the war on drugs and then the war on terror and how these all impacted Colombia. To really understand where the city and the country has been and where it is headed, you will have to pay a visit. It is pretty clear that the renaissance the city is experiencing is because there is peace. While the effective disbanding of the FARC by the government paved the path, what many locals in Medellin explain is that there is a truce between the gangs that operate in many of the barrios. Part of this is attributed to the reinvestment in the city in the form of “democratic architecture.” It is not a stretch to call Colombia’s conflict a class war. Pablo Escobar, who rose to financial power and Forbes’ lists did so from one of the poorest barrios in the city. His strategy of investing in soccer fields, housing and community centers certainly bought him a lot of followers, as well as his own neighborhood in the city which remains after his death. Ironically, despite actively fighting Pablo, the elite in Medellin recognized that for peace, there must be investment in the downtrodden parts of the city. Incredibly, Medellin now stands as a testament to what redistributed wealth can do to a modern, urban city with some of the most notorious drug distribution and violence. 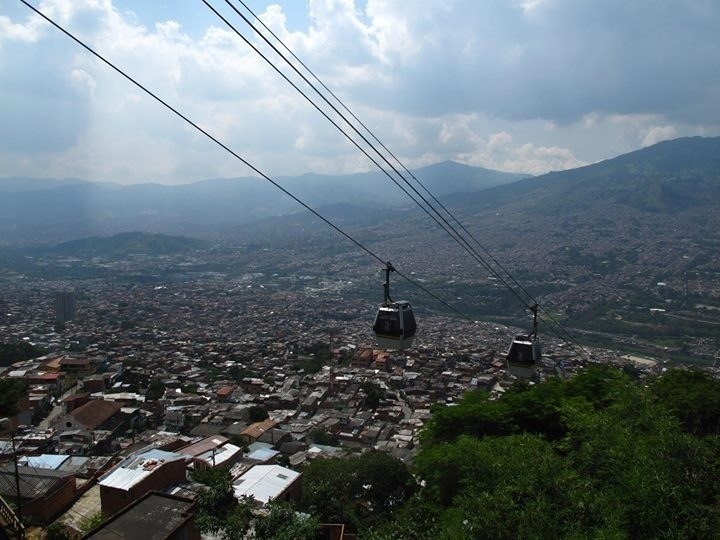 According to Michael Kimmelman for the New York Times, “linking rich with poor neighborhoods, spurring private development, the metro, notwithstanding shrieks elsewhere in Colombia over its questionable construction cost, is for residents of Medellín a shared symbol of democratic renewal.” The construction of the Metro has proven pivotal for the city. It allows people fromo the poor barrios in the hills access to the city center, something in the past that was unimaginable. As one would expect in virtually all cities, public transit is often marred with scratchings, grafitti and signatures. The metro and metro-cable in Medellin is spotless. This is because it is revered and respected as just that, democratic architecture, that brings the city together. Pride in the metro is indicative of pride in general. Medellin, capital of the region of Antioquia is comprised of what are called Paisas, self-proclaimed as the most “unique, special and intelligent Colombians,” as one told me. Colonized mainly by Jews and Basques escaping oppression in Spain, some argue that Antioquia inherited the industriousness of these cultures. 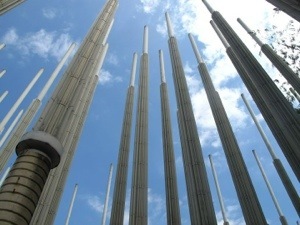 But as a modern city Medellin, like Colombia itself represents a melting pot. One would be hard pressed to describe the average Colombian. Afro-Carribean reggaeton bumps through the evenings on Calle Setenta, as does Salsa. Music is a pervasive aspect of the city. Movement seems to be perpetual, until people sit to enjoy rounds of beers and a menu del dia. Parque Arvi, a wild and forested area with fincas or small farms lies just a ride away on the metro-cable. Modern coffee shops and organic grocers line the touristy yet hip neighborhood of Poblado. Football fans clad in green for Nacional crowd the national estadio. The list goes on. The city has a clear cohesiveness that is apparent and exciting. But while the phoenix has risen, like most post-conflict societies, it is tenuous and in the blink of an eye, the dream could be over. What is clear is that a lot of people are invested in putting the past behind them, while being aware of it, and continuing the re-imagination of their city. Read: “A city rises along with its hopes” by Michael Kimmelman for New York Times. Watch: The Two Escobars This film from ESPN’s 30 for 30 series chronicles the rise of Pablo Escobar from the downtrodden barrios of Medellin to one of the richest, most powerful and violent figures in history. Juxtaposing this with the rise of the Colombian national soccer team through the emergence of Andres Escobar (no relation to Pablo) and his eventual murder, it unpacks futbol as not only a key to national identity but as the former money laundering scheme for the Colombian cartels. This is one of the most well thought out, insightful & coherent observations I have read in a long time. Andrew–your essay is a profoundly insightful and well written account not only of Columbia, but of reinvention in general. I love to read your rich, colorful and fact-laden prose, seasoned by the sights, smells and sounds if the people .i especially appreciate the polish in your writing; it shines! It will be so interesting to read about your reactions to Chile. Stay out if the way of the volcanos!